Western Massachusetts Electric Company (WMECo) is in the early development stages for its second large-scale solar facility in Springfield, Massachusetts. The 4.2MW solar project will use around 17,000 solar panels and be built over a capped landfill. WMECo did not release any contract details of the project, nor what modules or balance system elements will be used. 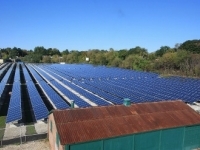 Massachusetts is working its way to 250MW of solar energy by 2017. Under its Green Communities Act, each Massachusetts electric utility can own up to 50MW of solar generation as approved by the Department of Public Utilities. WMECo is the first utility that received DPU approval and is currently permitted to install 6MW of solar generation. “Our solar program helps stimulate development of large-scale solar facilities and the demand for regional construction and engineering services. Our use of a capped landfill creates a new and viable use for an otherwise challenged property within our home city,” stated Peter Clarke, WMECo president and chief operating officer. Local permitting is in progress with WMECo setting its sights on construction to begin during this year’s second quarter. The completion of the project will fulfill the first 6MW of approval that the company was given by DPU.